I seemed to have reached a new world, so wild a place…far away from human society. Columbia, North Carolina, that is. We spent several days in this beautiful little town last week, part vacation, part getting out to see some of the region for the trails project I am working on with NCLOW. It didn’t help that it was one of the hottest weeks of the summer, but it did help that we spent much of it on the water. 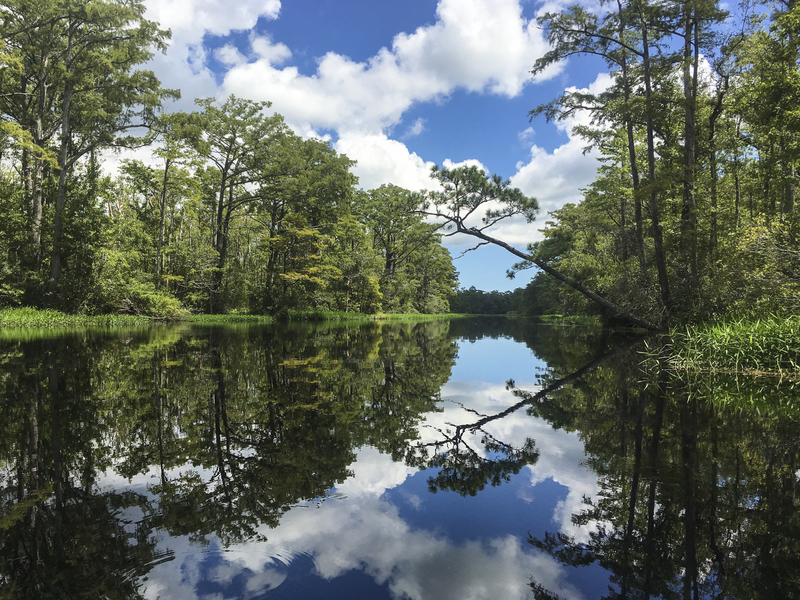 And this region has lots of water, from Lake Phelps, the second largest natural lake in North Carolina, to the Scuppernong River, to the numerous creeks and sloughs that beckon paddlers to explore. So, we decided to take our kayaks, throw them in where we could, and see what we could see in a few days on the water. First stop, was the NW Alligator River. I had scouted out some potential put-in points (they are few, unfortunately) so we decided to put in at what looks like an old boat ramp near where Hwy 94 crosses this section of river, about 14 miles south of Columbia. The access is now flooded, but there is a substantial old dock at the site, indicating its past use, perhaps in logging or fishery operations. 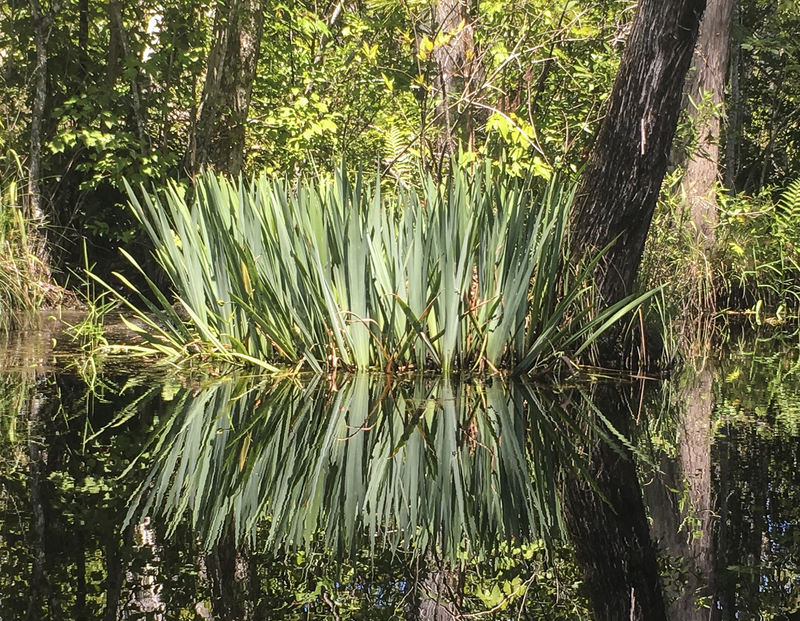 The lands surrounding this waterway have scattered trees, low pocosin vegetation, and a border of marsh grasses, including pockets of wild rice. Shortly after we passed under the Hwy 94 bridge, we spotted a bald eagle, who managed to stay with us much of the morning. The other wildlife highlight were several red-headed woodpeckers, flying between the many standing dead trees along the route. 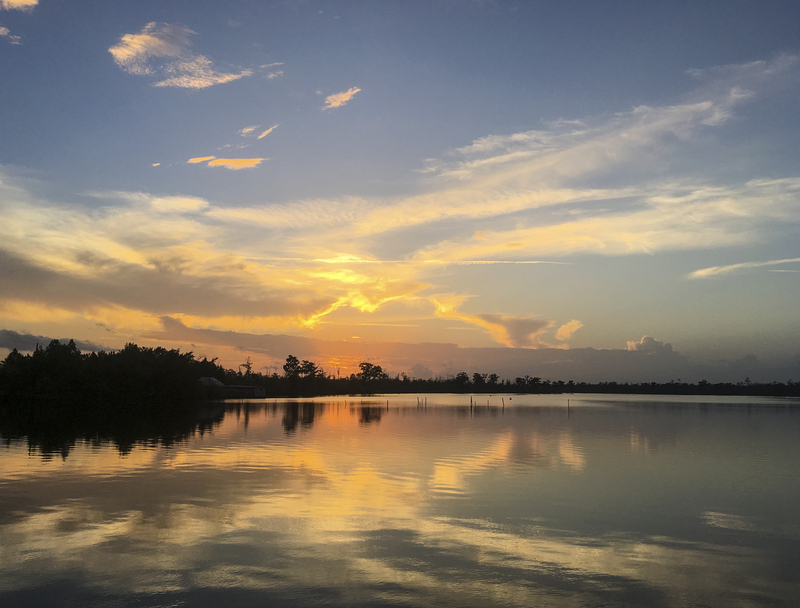 An abundance of clouds made for beautiful reflections and a respite from the heat. 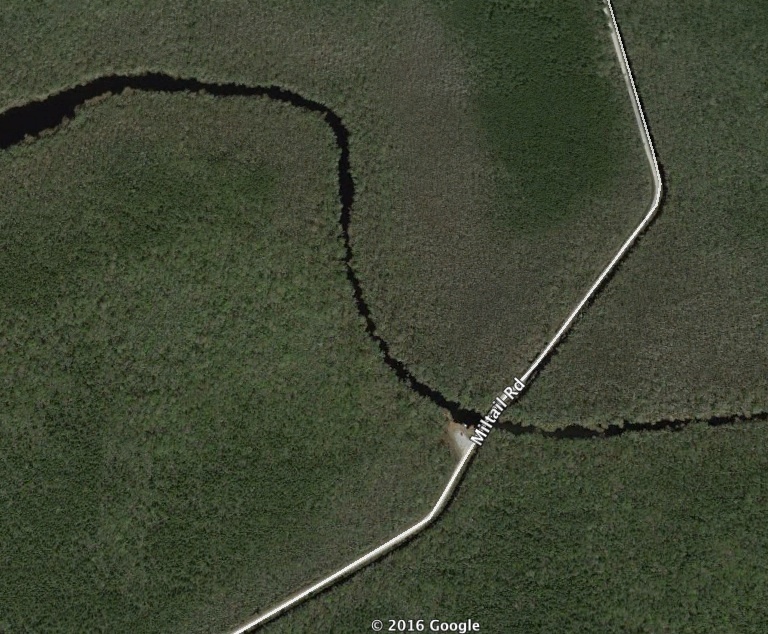 After paddling about 1.5 miles, we came to the juncture of the SW and NW branches of the Alligator, and headed north. The path narrows after this, and we found ourselves going through patches of alligator weed and a grass of some sort, most likely maiden cane. Patches of the alligator weed looked as though they had been treated (this is an invasive species that can clog small waterways and is often treated chemically by local agencies). 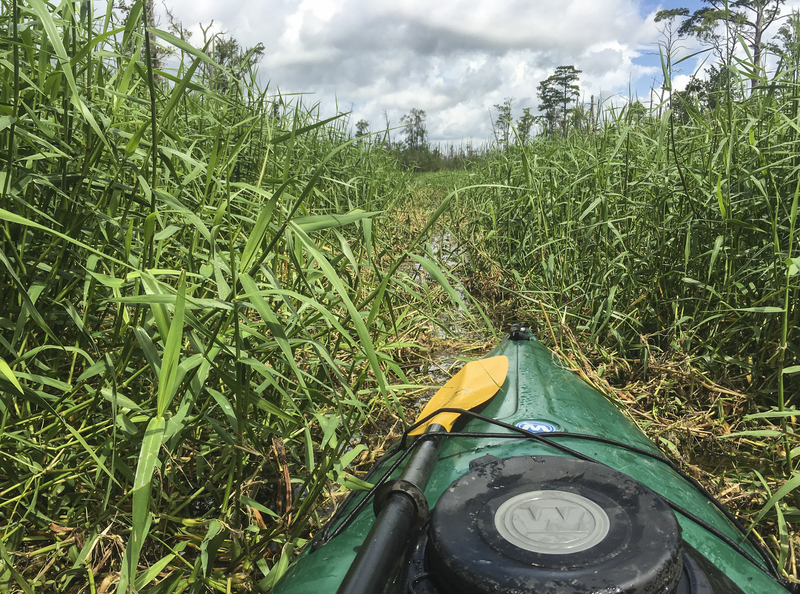 After paddling another couple of miles, we finally reached a patch of the maiden cane that seemed too large to easily push through, so we turned around and headed back. Our total paddle was about 5 to 6 miles. 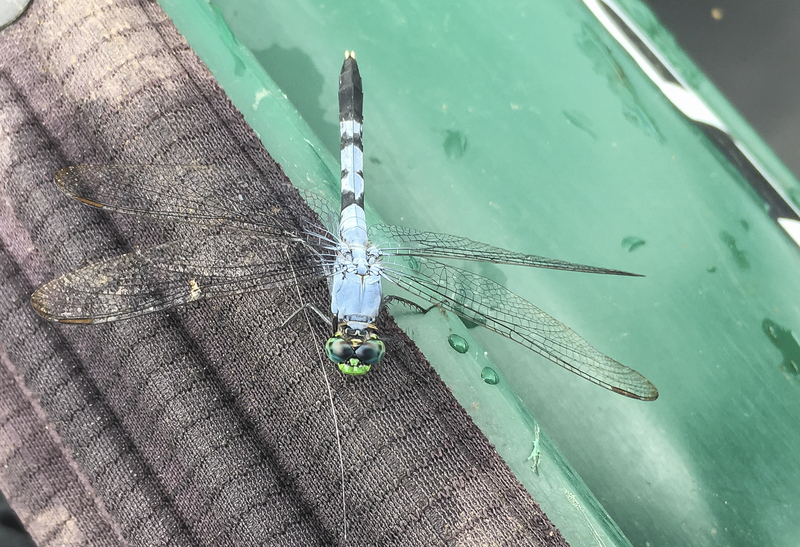 The only sounds, other than fish jumping, dragonflies buzzing, and woodpeckers drumming, was the distant hum of some crop dusters spraying some of the huge farm fields down the road. I want to go back in colder weather , once some of the vegetation dies back, and see if I can make it all the way up to the refuge road system. Friends recommended we try Riders Creek, near Columbia. It enters the Scuppernong River on the far left. 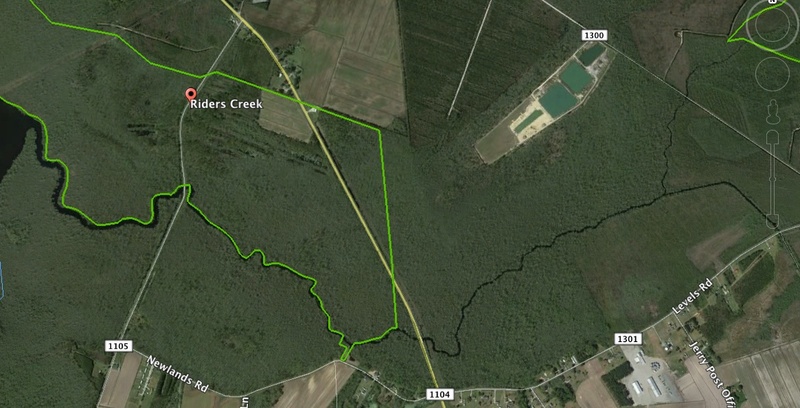 The next day we hit Riders Creek, a small tributary to the Scuppernong River about 2 miles south of Columbia. Finding a suitable launch site was again the challenge. 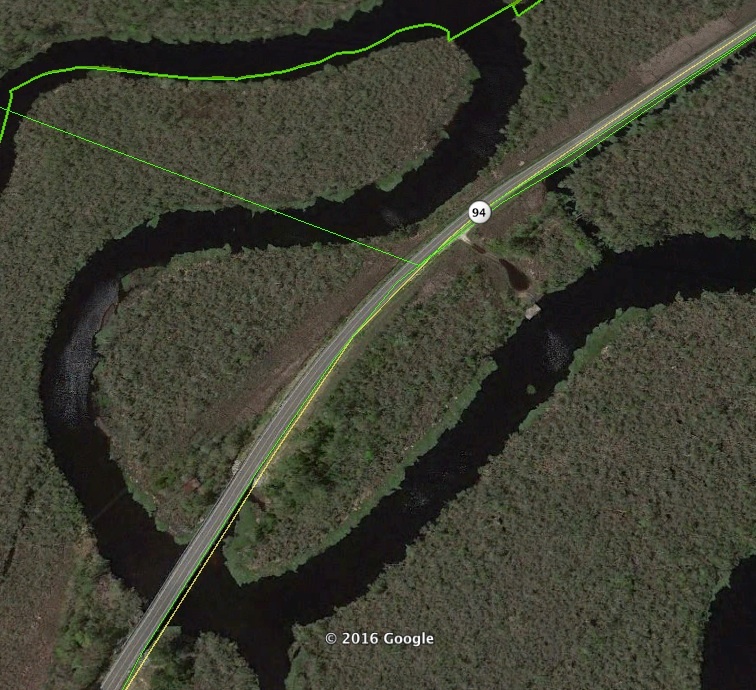 The two road bridges didn’t offer much so we drove down a side road after looking at Google Earth and Melissa tested a large log on the bank of a roadside canal as a potential launch site. Nothing fancy, but it worked. 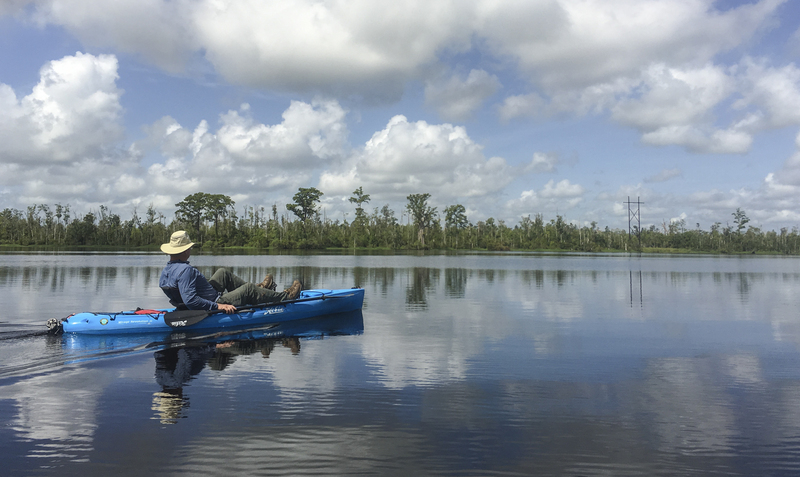 This day, we had help, and another paddler, and were dropped off (there is no place to park at this makeshift put-in) and planned to paddle back to the canoe/kayak launch behind the Pocosin Lakes Visitor Center in town, a total paddle distance of a little over 5 miles. The upper portion of the creek was my favorite as it is narrow and intimate, allowing us to see and hear the many bird species (prothonotary warblers, woodpeckers, and a great horned owl) and appreciate the small things along the way (an owl feather floating on the black water, the distinctive webs of the many black and yellow argiope spiders, and a clump of blooming cardinal flower adding a splash of brilliant red to the sea of green around us). 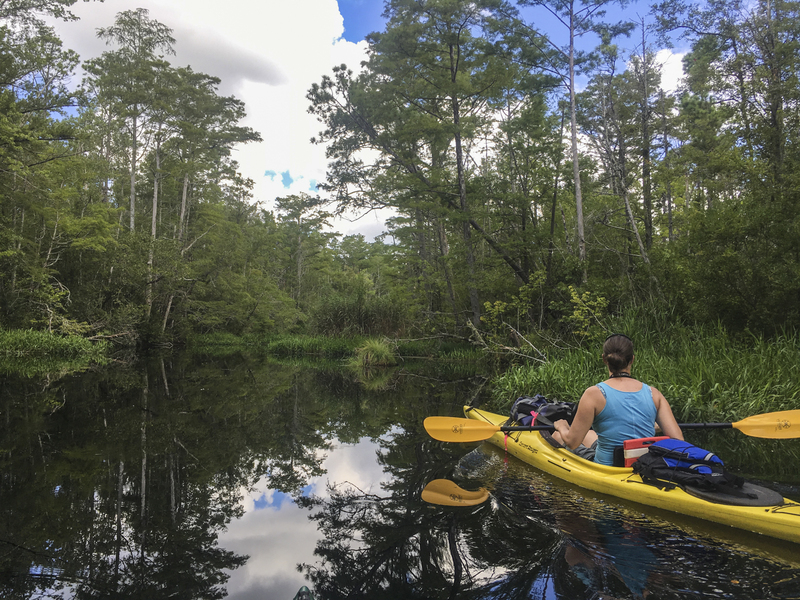 It was another great paddle, only a couple of hours long, but through a beautiful swamp forest, into the wide waters of the lower Scuppernong, and ending back in the picturesque town of Columbia. And, we were the only ones on the water, probably not unusual in this underutilized area of rich scenery and wildlife. 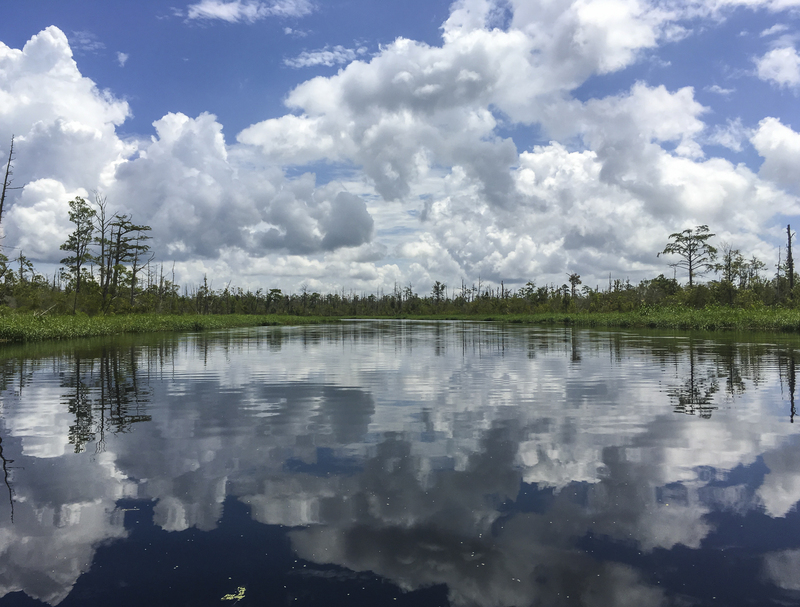 That afternoon, we drove through portions of Pocosin Lakes National Wildlife Refuge and saw a few bears (no surprise) as well as some smaller wildlife. 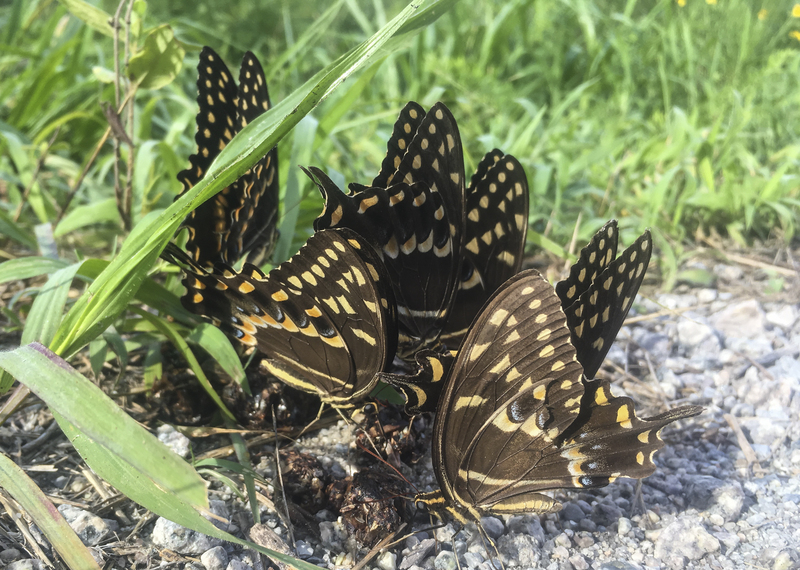 The palamedes swallowtails were out and about everywhere, and we managed to find a large canebrake rattlesnake crossing one of the refuge roads. I never tire of seeing this magnificent reptiles, and the refuge seems to have a healthy population. Our last stop was at the pocosin overlook at Pettigrew State Park, along the south shore of Lake Phelps. The clear water at Lake Phelps is such a surprise after spending a couple of days in the dark, tannin-colored waters of the region. It made for a refreshing dip on a hot afternoon. NCLOW is looking at how we might help bring more tourists into this region to explore and enjoy its rich natural and cultural heritage. 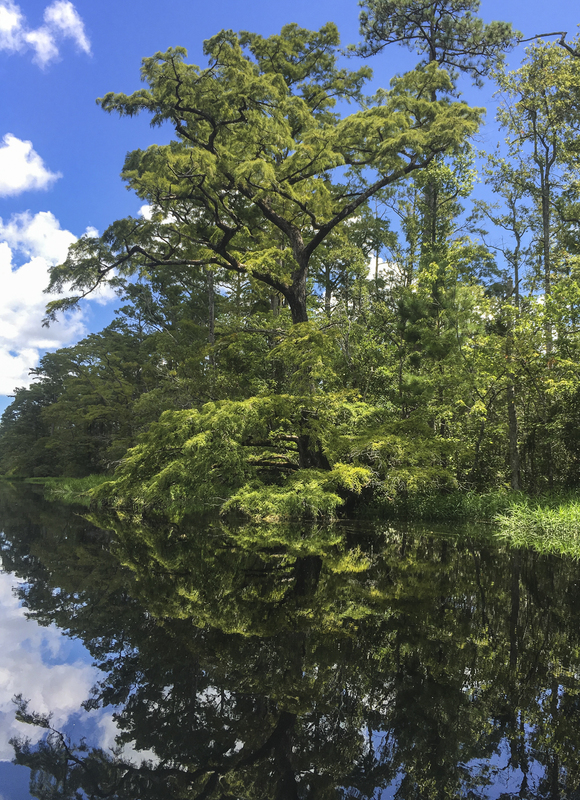 The waterways here offer scenic beauty, abundant wildlife, and the chance for quiet and uncrowded paddling. And Columbia is a beautiful town with a rich history and great potential. It is also home to Pocosin Arts, a real treasure of eastern North Carolina, whose mission is to connect culture to the environment through the arts. They offer a range of classes year-round, and are looking at ways to incorporate even more of their unique natural surroundings into their offerings. 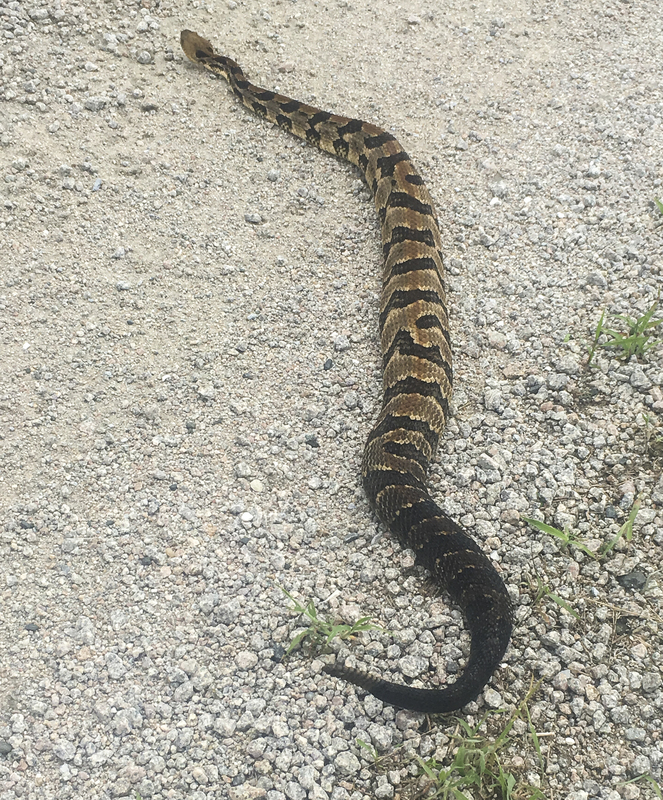 One area that does seem to be getting a lot of attention from tourists is nearby Alligator River National Wildlife Refuge. Situated only about 15 minutes from the Outer Banks certainly helps fuel the busy summer tourist season on this refuge. It is known for its large population of black bears and for paddling opportunities along Milltail Creek. 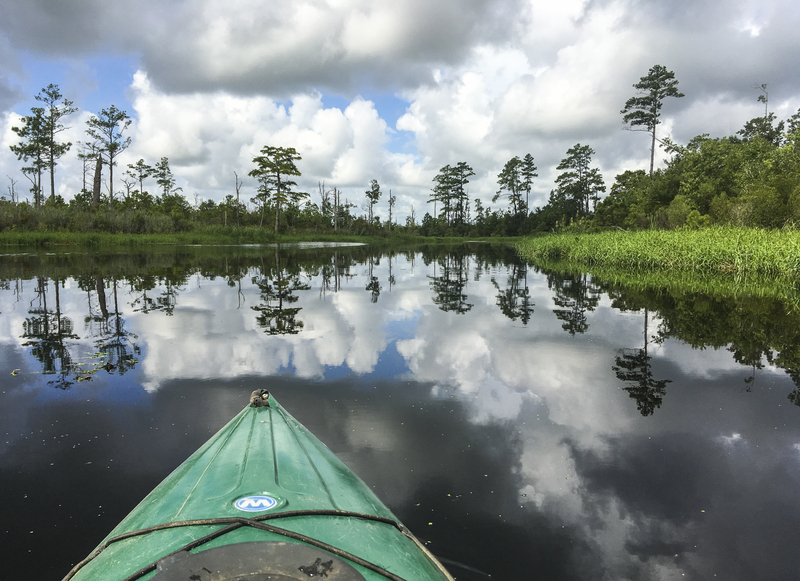 Several OBX outfitters provide canoe/kayak rentals and guided trips on the refuge. We decided to spend our last paddle day checking out this area. 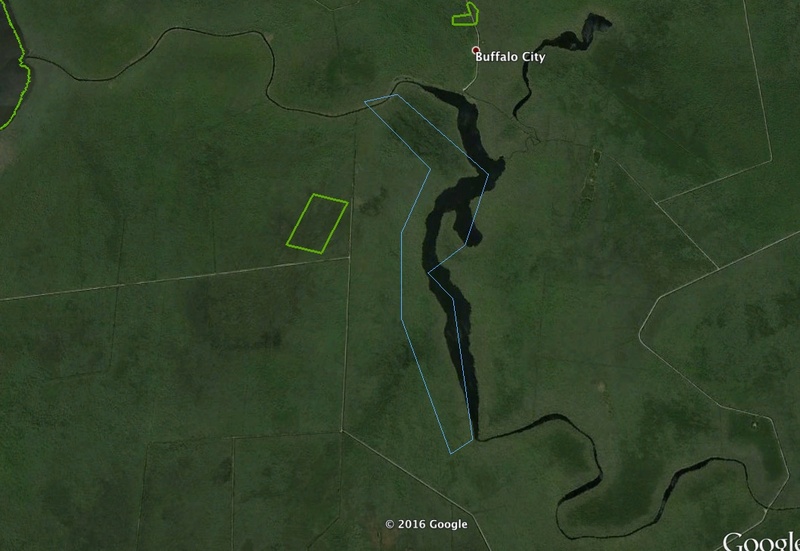 We drove to the main launch site at Buffalo City and were surprised to see 10+ vehicles, a crowd of people, and probably 20+ kayaks and canoes. Most people probably go downstream along Milltail Creek, so we decided to drive to another, lesser-known launch site upstream to seek some solitude. 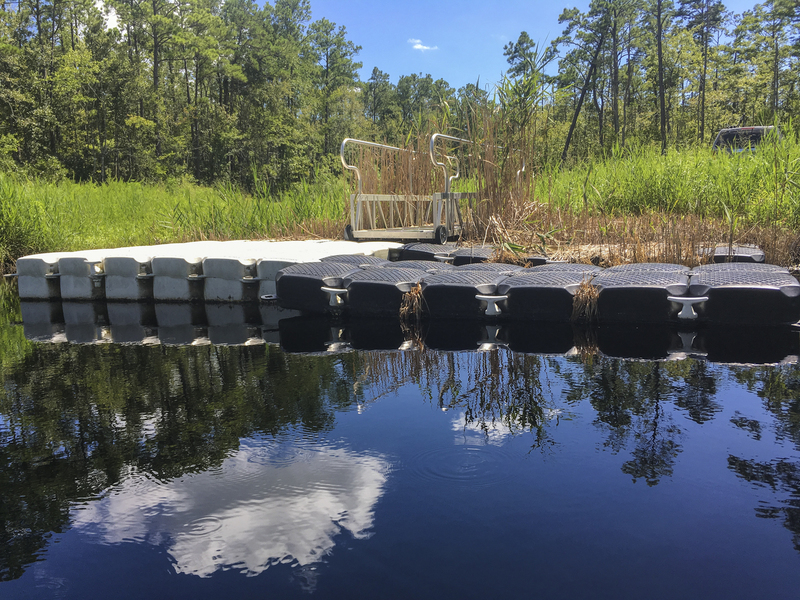 Besides the advantage of proximity to a large tourist population on the Outer Banks, the refuge also has two well-maintained launch sites on Milltail Creek. Ours had a neat floating dock that makes for a very easy launch. As we put in, a trailer with 6 boats pulled up, so I guess this site is not as unknown as I had thought. We quickly got out ahead of the group and for a few hours felt like we were the only people anywhere near this beautiful swamp. We paddled for a few hours, traveling a total of about 7 miles out and back. The creek is rich in bird life and we saw lots of wood ducks, herons, and a few anhinga. 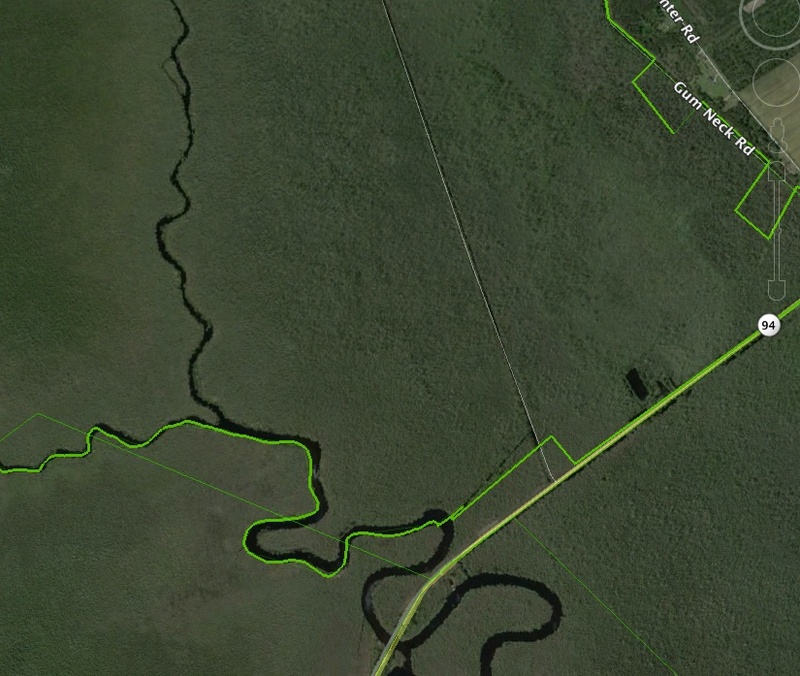 My highlights were seeing a large alligator and a black bear along the route. The scenery is beautiful, it is incredibly quiet (if the jets are not buzzing overhead), and it is a great combination of solitude, ease of access, and abundant wildlife. I can see why it is such a popular destination. 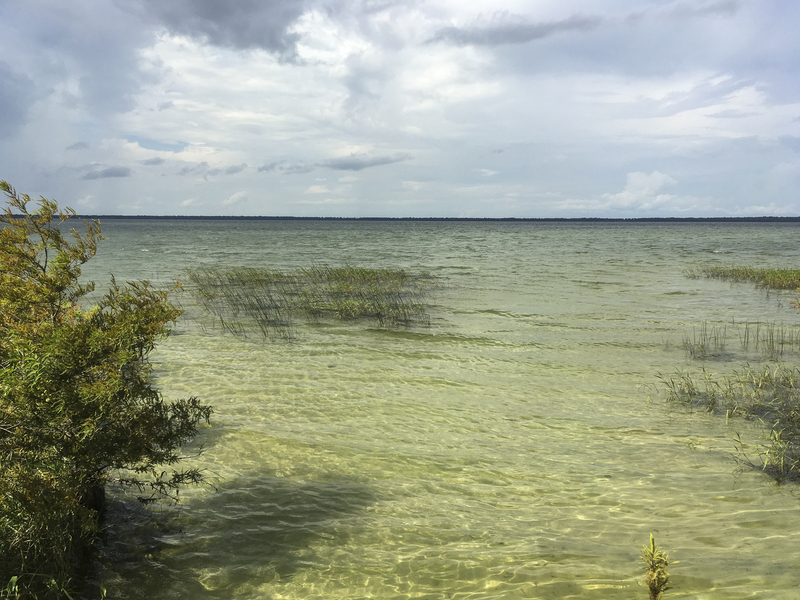 At one point along the way, I noticed a large bald cypress tree hugging the shoreline. 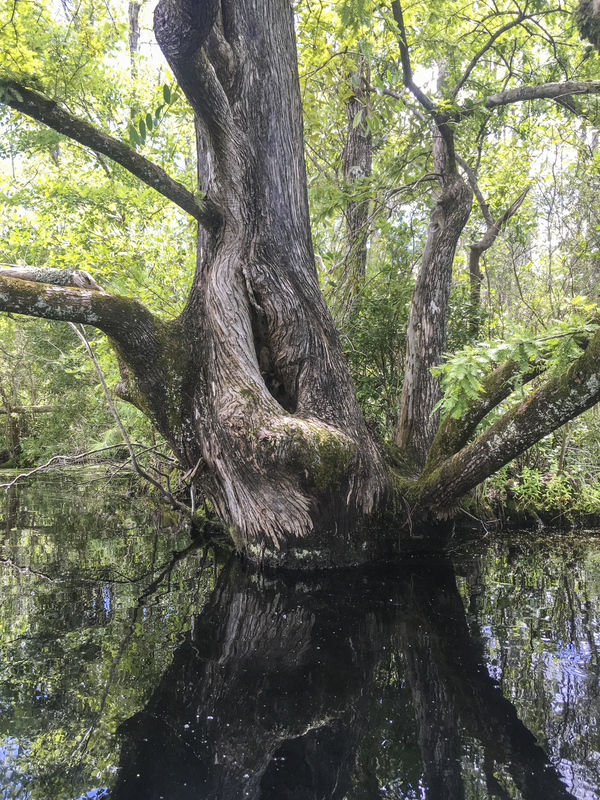 Its large limbs draped down, seemingly embracing the dark water, making it look like a perfect place to pull in and escape the sun. Sure enough, it offered a chance to climb out of our boats, relax for a lunch break, and it provided a Swiss Family Robinson moment for a couple of thankful paddlers. 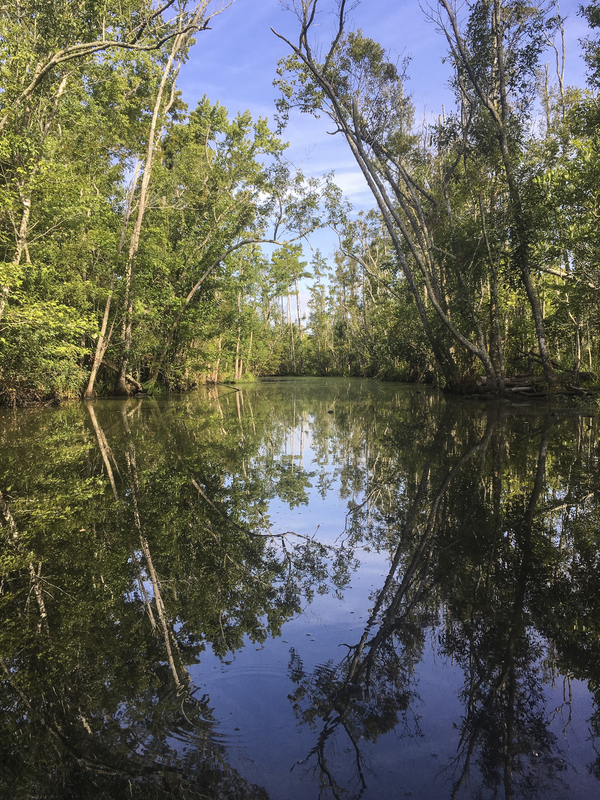 Our three days of paddling showed me the great potential for the Scuppernong region, truly one of the jewels of wildness in our state. I hope we can help foster an awareness and appreciation of the incredible resources of this unique area, provide some economic opportunities for local entrepreneurs, and maintain the incredible natural heritage and beauty of this wild landscape. On our way home, we decided to check out an area that is making a strong effort to do just that. The town of Windsor is located along the Cashie River, between Williamston and Edenton. 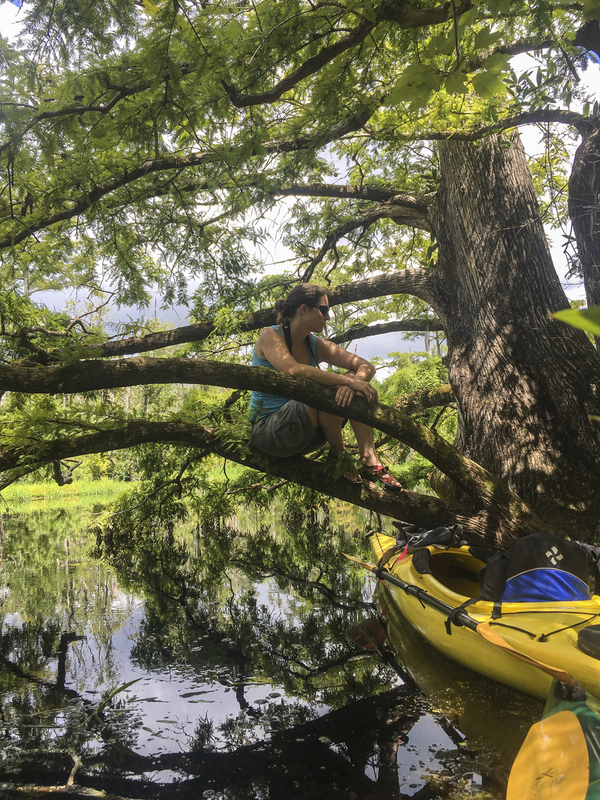 The town is making a commitment to ecotourism along its waterways (see Destination Windsor) with kayak and canoe rentals, pontoon boat tours, a wetlands walk, and the recently completed tree houses. 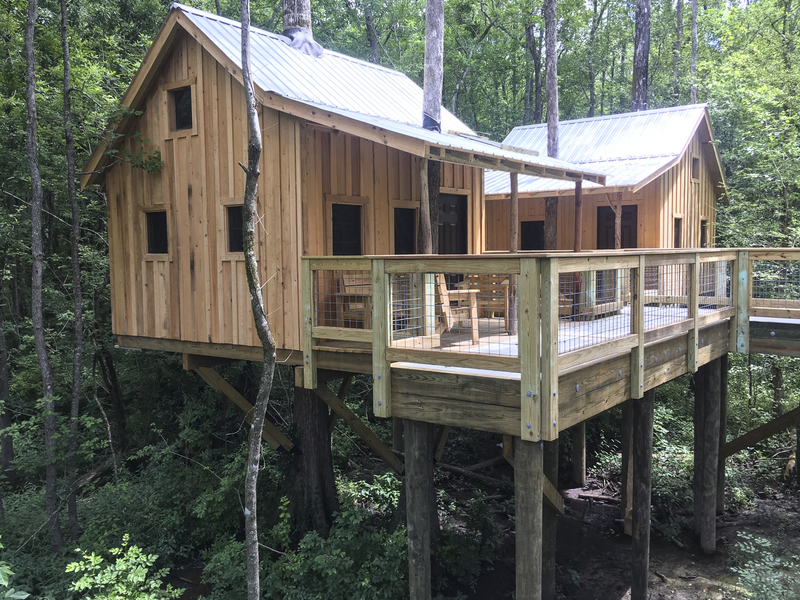 These two tree houses, funded in part by grants, are to be the start of a village along the river including a few more tree houses and a renovated campground. They hope to have these available for rent starting this fall. It looks like a great start to getting visitors to come to appreciate their natural surroundings. Let’s hope they prove successful and can pave the way for more such ventures in the wilds of eastern North Carolina. 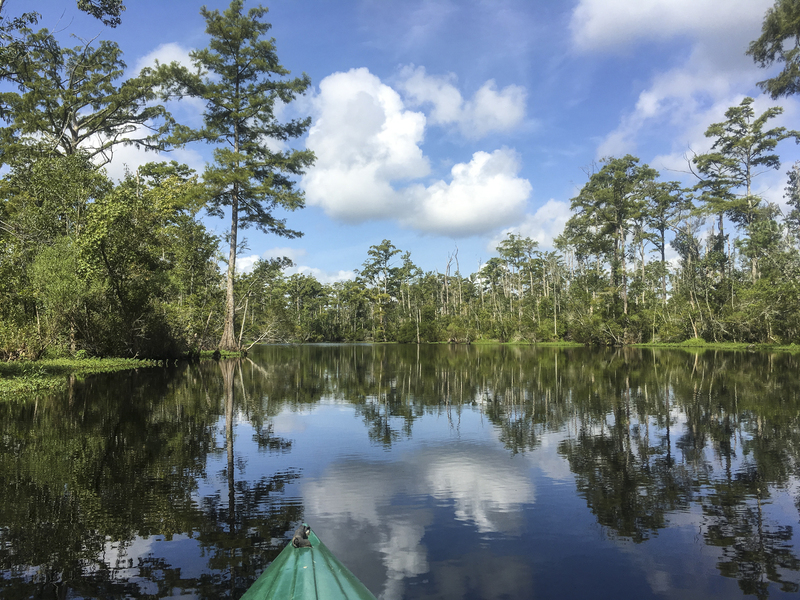 This entry was posted in Trip report and tagged alligator river national wildlife refuge, kayaking eastern NC, mattamuskeet national wildlife refuge, pocosin lakes national wildlife refuge, Scuppernong region by roadsendnaturalist. Bookmark the permalink. What a great trip, thanks for sharing it with us! Thanks, Mary. A beautiful part of our state! Absolutely awesome!!!! Thanks for sharing!!! Thanks, Rose…and, yes, it is s beautiful area for sure. I would think staying in the tree houses would be awesome.